The TV vs. Fireplace Challenge. What is the focus? So where do you place the TV in your main living space when you have a fireplace? Based on the research I have done (in addition to extensive television viewing), the proper mounting height for a TV, for viewing from a seated position, is at your seated eye level. Therefore, it is important that your TV location and home electronics are designed and planned for as part of your overall home design. The location of the TV and the accompanying electronics need to be planned for. If you must have the TV above the fireplace get it as low as possible, which I suggest 50" maximum to the bottom of the TV from the floor. In this sketch I created (below), I have drawn a 48" wide x 32" high firebox and flush hearth (a flush hearth is also good to save floor space). The space between the firebox and the mantel is minimized. I set the TV back 6" from the front of the fireplace to keep the heat away from the TV. The sides can be flanked with built-ins for additional storage, or the vertical element of the fireplace and TV can stand alone. 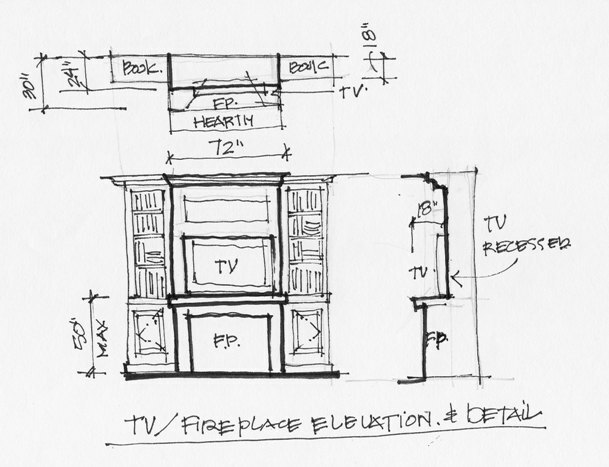 Don't let a builder, mason or fireplace insert salesperson tell you where the firebox or TV should go. Consult with a home electronics specialist. Plan it through and think of the desired end result and furniture layout, then work backwards so you can avoid the mistake. This is a small example of the benefit of working with me to help you work out important details in your home design. I can work with you to redesign one room or a whole house. Call or email me to learn more about the benefits of working with a qualified designer to make your home the best it can be and avoid costly mistakes.